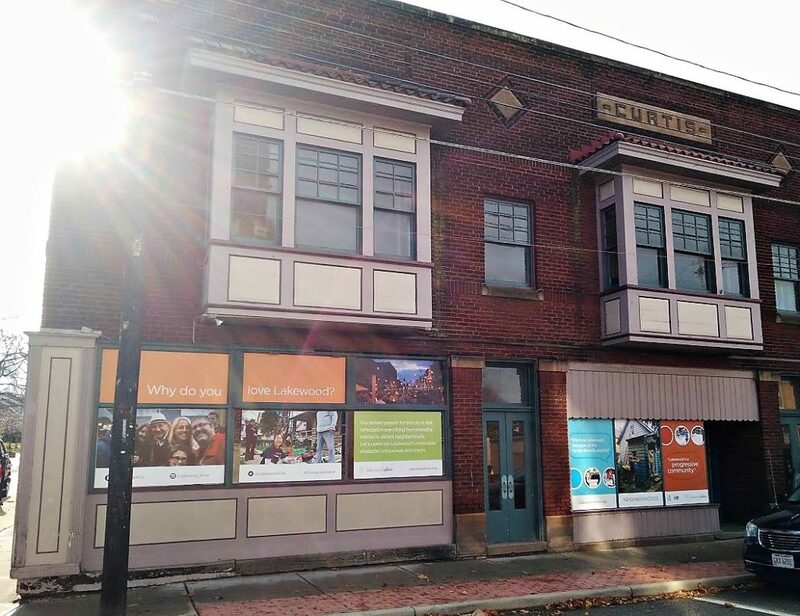 LakewoodAlive’s Design Committee worked with the City of Lakewood to activate the Curtis Block’s storefront windows. Walk past the historic Curtis Block building at 14501 Detroit Avenue in Downtown Lakewood and you’ll notice an attractive new window display. This vibrant addition to the urban landscape represents a culmination of a collaborative effort spanning months. 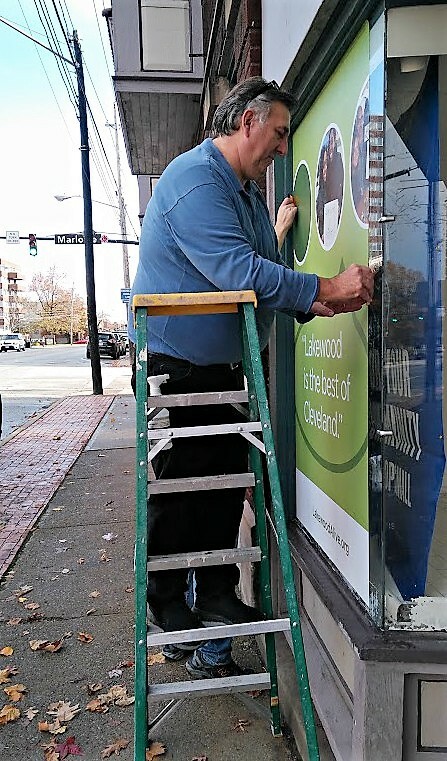 LakewoodAlive’s Design Committee worked with the City of Lakewood to activate the Curtis Block’s storefront windows. The end result: A beautiful window display installed just in time for Light Up Lakewood on Dec. 3. The Design Committee – consisting of Chair Robert Donaldson, Randy Doi, Bryan Evans, Chris Frohring, Bili Kribbs, Dru McKeown, Marcia Moll, Jim Pinter, Heather Rudge, Rick Sicha and LakewoodAlive Executive Director Ian Andrews – sought to enhance the asethic appeal of this architectually-significant building, which was constructed during the early 20th century and has been designated as a historic structure. Shawn Warren of Erie Design works on installation of the Curtis Block window display. LakewoodAlive commissioned Dana Anderson, owner of The Beehive Studio, to design the new window display. Anderson created a series of 25 window display panels depicting images of various Lakewood spots and quotes from Lakewoodites regarding the city they love. The quotes were gathered during a two-year “Why I Love Lakewood” campaign undertaken by LakewoodAlive’s Marketing Committee. Local small business Erie Design printed the final product at its store at 16504 Detroit Avenue. Co-owners Shawn & Julie Warren and their team completed installation of the new Curtis Block window display on Nov. 29. Both the City of Lakewood and LakewoodAlive’s Downtown Lakewood Business Alliance (DLBA) sponsored the project, along with Citizens Bank, which provided generous financial support via a grant. The new Curtis Block window display consists of 25 panels.